February rolled around and it was time to celebrate the birthday recipients for the month, as is our usual custom. We thought that we may have had to delay the good times, because of the potential inclement weather, but once again the weather forecasters were wrong and could still keep their jobs, instead of four to six inches of snow, we had a clear day and evening. Among the honorees was my Mother-in-Law and two of our grandchildren, and next year God willing they will both have milestones; one will celebrate ninety years and the other will have her Sweet Sixteenth. What great thoughts for both of them. As is the usual routine for my Bride, she was her Whirling Dervish in the kitchen and she prepared a wonderful dinner. For appetizers she had several assorted cheeses and our Daughter-in-Law made some dips as well. My Bride made a roast beef, chicken and salmon. She also prepared Armenian Pilaf, mashed potatoes, Caesar Salad, vegetables and there were also some sides that others brought over as well. For dessert she changed the usual birthday cake to cupcakes, cookies and my Mother-in-Law made her chocolate puddings. There was very little left to wrap up as most of the food was enjoyed that evening. For our wine drinking family, we brought in some sweeter wine for those that enjoy this type of beverage. 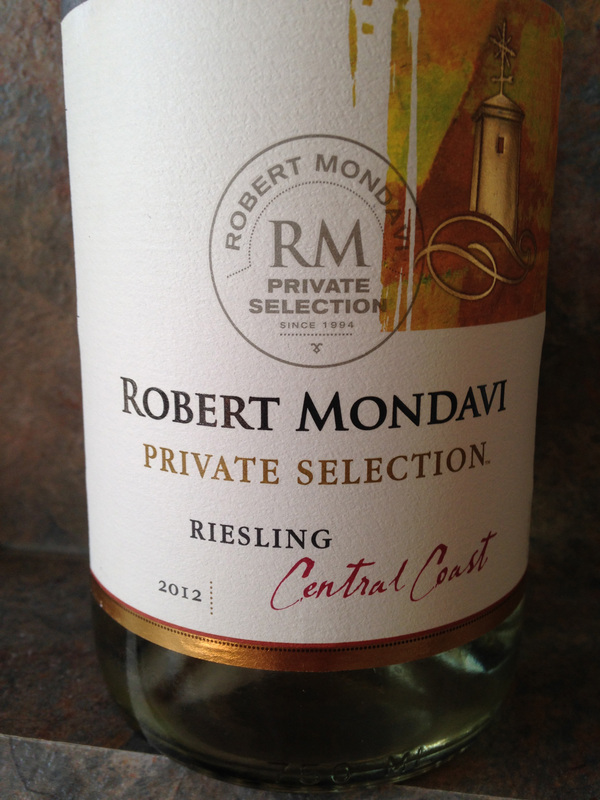 We were serving Robert Mondavi Central Coast Riesling 2012. The Mondavi family has had a long and popular reign in California, as they produce wines from generic to powerhouse wines. This particular Riesling was a step above the generic “California” wine and came from assorted vineyards in the Central Coast and was appreciated by those guests that find some of the wines that we serve too dry. I always get a kick out of how so many of these wines have marketing modifiers on the labels that have no true importance as in “Private Selection,” but it makes the wines appear all that more special. We also were pouring La Crema Sonoma Coast Chardonnay 2012, as my Bride seems to enjoy having a glass or two of Chardonnay as she scurries around the kitchen preparing and overseeing the many dishes that she will be presenting. I also decided to try a bottle of wine that we had purchased recently and I had never had a wine from this area, and I had wrote about this wine when we had purchase it and now it was time to try it. 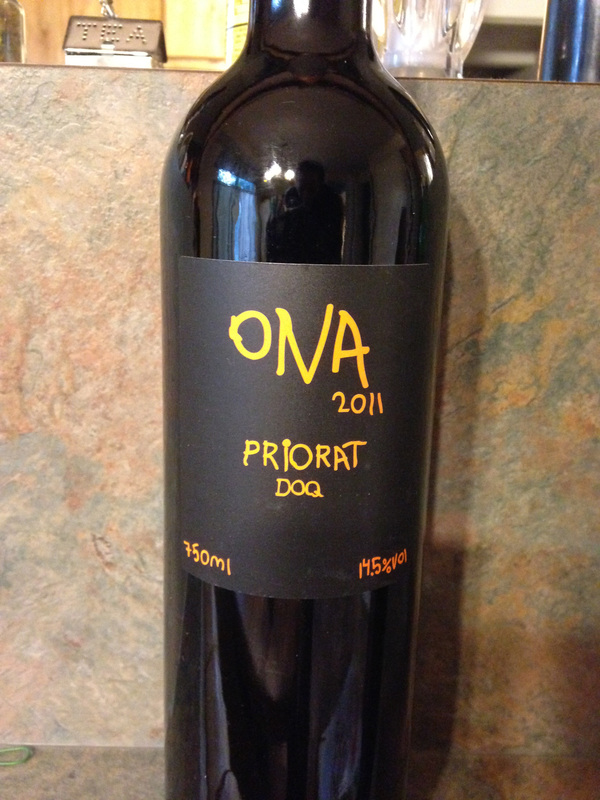 We opened up a bottle of Ona Priorat 2011 from the Catalan region of Spain. Priorat is one of two DOCa designations (DOQ in Catalan) in Spain, the highest qualification level for a wine region, the other being Rioja. This wine was a blend of Garnacha (Grenache), Syrah, Carinyena (Carignan) and a splash of Cabernet Sauvignon. The maker of the wine Blai Ferre Just used fruit from the Mos del Billo vineyard in Folset, and this is a relatively new vineyard as it was planted in 1999, and there was a production of 565 cases of wine. I should also mention that the label was designed by the daughter of the distributors of this wine, which even made it more fun. I found this wine to have enough spice and taste to work with not only the roast beef, but with the chicken as well. I am glad that I finally opened up this wine. This entry was posted in Dining, Wine and tagged Blai Ferre Just, Cabernet Sauvignon, California, Carignan, Carinyena, Catalan, Central Coast, Chardonnay, Folset, Garnacha, Grenache, La Crema, Mos del Billo vineyard, Ona, Priorat, Riesling, Robert Mondavi, Sonoma Coast, Spain, Syrah. Bookmark the permalink. Happy birthday to all! We have 3 Feb birthdays and 2 early March in our family so Feb is bday month for us too. Cheers. John, Thanks for the info on the wine from Priorat. I am heading there in September to tour some wineries, staying in Falset, and most definitely will look for this producer. Bill, I am glad to offer just a glimmer of information and I do hope that you have a wonderful holiday in Spain, and I look forward, along with everyone else, to reading about your trip.